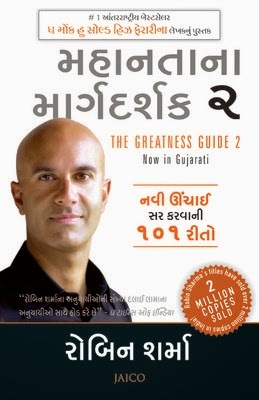 Now In Gujarati 101 WAYS TO REACH THE NEXT LEVEL In this highly anticipated sequel to the international bestseller The Greatness Guide, Robin Sharma shares the remarkable insights and tools that have made him one of the world’s most trusted advisers on leadership and personal success. Compelling, engaging and truly unforgettable. Within the pages of The Greatness Guide, Book 2, you will receive uncommon advice that will excite, energize and elevate you, including “Be So Good They Can’t Ignore You,” “Ask to Get,” “Fail Faster,” “Be a Cool Brand” and “Live an Intense Life.” Part manifesto for excellence, part business mastery manual and part inspirational companion, The Greatness Guide, Book 2, distills Robin Sharma’s latest thinking into 101 simple yet powerful lessons that will help you work brilliantly and live beautifully. Getting to world class begins with a single step. Start today.